(CNN) -- Carlos Tevez is wanted by clubs in Spain and Italy as well as England's Premier League should Manchester United choose to show him the door when his loan deal expires at the end of the month. Argentine striker Tevez is still hoping Manchester United will offer him a new deal at the end of the month. Argentine international striker Tevez is clearly frustrated at United manager Alex Ferguson's failure to open talks regarding a permanent transfer to the defending Champions League finalists. On Sunday Tevez ran in the direction of Ferguson and United chief executive David Gill and cupped his hands to his ears after scoring in the 2-0 win over Manchester City that left the club on the brink of another Premier League title. Tevez's agent Adrian Ruocco told Argentine newspaper Ole: "He might move to Spain, Italy or stay in England. There are interested clubs from all those countries. "He already said he would like to stay in the Premier League because he likes football in the country, so he fortunately will decide where he will play. He is lucky to have the chance to choose." Ruocco said: "There was no will from the directors and the coach to sign a new contract. On May 31, he will have no club and no contract. I don't know why, but Manchester (United) have not asked for any renewal (of the loan) nor signing him for next season." He added: "The directors and the coach do not seem to want him, while on the other hand fans love him." However, Tevez's adviser Kia Joorabchian stressed the striker would not rush to a decision over his future before the season ends. Although a permanent move to United remains a possibility, Joorabchian is also aware of interest in the former West Ham frontman. "There's a lot of interest in Carlos, but Carlos has always been very focused and very concentrated," Joorabchian told Sky Sports News. "For the respect of the team, the manager, the club, and the fans, we have to stay focused on finishing the season on a high. "This is how he's always been. He wants to do the best he can. He will let the season finish and then sit down and evaluate the situation." 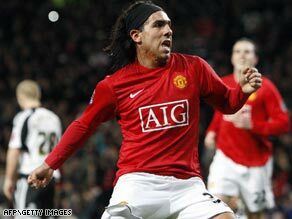 Joorabchian indicated Tevez would "move on and think about his own future" if there is no movement by United to sign him permanently, with a move to another English club a desirable option. "What he wants to do is to go to a club which has real ambition, a real focus, to be champions of England, champions of Europe, champions of everywhere," Joorabchian said. "Obviously leaving United he would have to go to a rival in order to achieve that target. But he understands it's not in his control." "I don't want to direct, saying it's going to be Liverpool, City, Chelsea, Arsenal, Everton, Tottenham -- whoever you can pick out -- Milan, Real Madrid, Barcelona, Juventus. "The key is that at the present moment Carlos is a United player and he's focused on being a United player for the rest of the season."